Combine 2 great products for a healthier swimming pool. Paramount’s powerful combination of ClearO3 Ozone Oxidizer and Ultra UV2 Ultraviolet Water Sanitizer makes your pool cleaner, healthier and sparkling clear – while dramatically reducing the amount of chlorine needed, saving you time and money year after year. The SG Series is a versatile range of quality salt chorinators for those that prefer a salt water pool. Available with 20g/hr and 30g/hr output, plus optional pH control and additional timed power outlets. The award winning Chemigem D10 is the fastest, most efficient method to sanitise your pool. 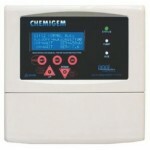 The Chemigem measures water quality and adds chemicals to ensure that your pool is clean and safe to swim in. With a Chemigem, the “hit and miss” methods of dosing by hand are a thing of the past. Pool water chemistry is regulated automatically – providing consistent levels of water sanitation while using far less chlorine and acid. This means you get a better result – and save money! The Gemini System is a fully-controlled salt water management system. 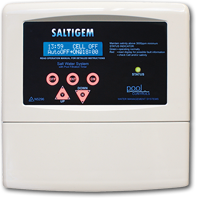 Pool water sanitiser and pH levels are continually analysed by the Gemini Control unit, which activates the Gemini salt or mineral salt chlorinator as required – and also keeps the pH within the optimum range. This results in great energy savings and puts an end to over-chlorination, which can lead to bleached pool blankets and pool shells. Paramount’s Ultra UV Water Sanitizer provides an additional layer of protection beyond the capability of chlorine or salt based chlorine generators. As water circulates through the Ultra UV chamber the UV light immediately inactivates 99.9% of micro-organisms and algae which are resistant to chlorine. This provides a cleaner, clearer swimming environment with zero harmful by-products and reduces the amount of chlorine needed to maintain an adequate level of residual sanitizer. The Clear O3 is a water purifying system that can be added to new or existing pool that provides the cleanest water possible. Ozone breaks down non-living waste products in the water which can combine with chlorine to form unhealthly by-products that can irritate skin and have been linked to asthma and other ailments. The use of ozone reduces the need for pool chemicals by up to 70% and means the chlorine in the water can work more effectively as a disinfectant. The cylindrical chamber of the Paramount ClearO3 system is optimized for maximum ozone generation and is sealed to minimize ozone leakage making the unit both powerful and safe around swimming pools. Radiant heat ribs dissipate heat to maintain ozone output at peak operating temperatures and the side panel is removable, making maintenance and bulb replacement easy. By reducing the chemicals needed to properly maintain the water, ClearO3 provides a more environmentally sensitive solution, and the only byproduct is oxygen.